Contains omega 3, 6 & 9 fatty acids, plus CoQ10. 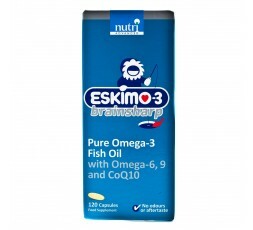 Eskimo Brainsharp combines the unique stable fish oil, Eskimo-3, with the extra ingredients CoQ10 and GLA. The Eskimo-3 fish oil in Eskimo Brainsharp is derived from oily fish living in the deep seas of the Antractic and South Atlantic. Eskimo-3 is one of the best researched and omega-3 supplements available. The CoQ10 in Eskimo Brainsharp complements the formula with its ability to support energy production and act as an antioxidant to help support healthy brain function. CoQ10 deficiency is common among older adults. The GLA in Eskimo Brainsharp is provided from Evening Primrose Oil. Eskimo Brainsharp is supplied in a liquid or capsule form, with no fish odour or aftertaste due to it's stability. The liquid is supplied in a pleasant lemon flavour. Nutri Eskimo Brainsharp is a new stable fish oil preparation designed to help support healthy brain function, containing omega 3, 6 & 9 fatty acids, plus CoQ10. Capsules: Two capsules twice daily with food or as professionally directed.